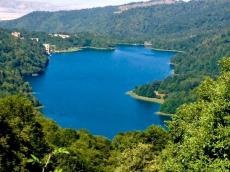 The sanitary-protected zone of Azerbaijan's Goygol National Park has been approved on an area of ? ?456.82 hectares, including 303.58 hectares located in the Goygol region, 73.2 hectares in the Goranboy region and 80.04 hectares in the Dashkasan region of Azerbaijan, Trend reports referring to the Cabinet of Ministers. In connection with this, changes have been made to the Law on Specially Protected Nature Areas and Objects according to the approval of the sanitary-protected zone of the Goygol National Park. The decision was signed by Prime Minister Novruz Mammadov. There are 9 national parks in Azerbaijan, distinguished by their high natural diversity, inhabited by hundreds of species of rare representatives of the flora and fauna listed in the IUCN Red List. Unlike nature reserves, which are out of bounds for tourists, National Parks are open to the public. In addition to the environmental function, they also serve the purposes of environmental education and the development of ecotourism.